I have never met an atheist who would claim that religion is the source of all evil in the world and that a post-religious world would necessarily be some sort of Utopian paradise. In the interest of full disclosure, I have encountered more than a few atheists online who say things that make me suspect they may believe this; however, I am reasonably confident that these atheists are a small minority. Many atheists long for a post-religious world, but we are realistic about what it would involve. 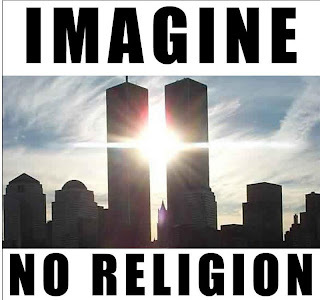 We do not imagine that perfection would be at hand if only religion would slip into the dustbin of history. Progress, yes; perfection, no. The far more common view among the atheists I have known and most of those I have encountered online, and the one to which I personally subscribe, is that religious belief (i.e., faith) facilitates evil in a way that few other organizations or belief systems are capable. This is an important part of what is so bad about religion. Again, the claim is not that religion is somehow the source of all evil but that it facilitates a particularly devastating form of evil. When attempting to convince theists of the perils of faith, many atheists are tempted to start listing religious atrocities. This is an understandable impulse, as there is a nearly infinite number from which to choose, but this is probably a dead end. Historic examples will be disregarded as irrelevant for occurring in another age, and modern examples will be dismissed as being committed by false believers (e.g., denial that the perpetrators were "real Christians," etc.). No, the case must be made by examining the nature of faith itself and the manner in which it was (and still is) used to justify some of the most despicable acts imaginable. As Richard Dawkins noted in The God Delusion , religion is inherently divisive. While it undeniably unites those who share a common belief, it does so by dividing them from all others. As Dawkins points out, religion divides us in ways that other types of human differences (e.g., nationality, politics, etc.) generally do not. Examples include labeling children as belonging to various faith traditions about which they may know little, segregating schools, and taboos about marrying out of the in-group. The effects of this divisiveness on assorted conflicts are well known and do not need repeating. This divisiveness all by itself would be problematic but what makes it far more serious is the manner in which religion serves to dehumanize members of the out-group. We see what the Christian bible says about how nonbelievers are to be dealt with, and we are all familiar with Qur'an instructs when it comes to infidels and apostates. Not content to merely separate the out-group, religion makes the wholesale slaughter of out-group members permissible (and in some cases, almost mandatory). Even children of a certain age typically recognize that engaging in good behavior and refraining from bad behavior solely because one anticipates reward and fears punishment are not exactly the pinnacle of moral behavior. I suppose I must admit being glad that those Christians who have claimed over the years that they would murder me but for their faith do in fact have their faith, but I have real difficulty seeing this as a moral system worth teaching. When religious believers tell us that their preferred scripture is "holy," "divine," or the inerrant word of some god, we have little choice but to take them at their word. Unfortunately, this is a terrifying thought for those of us who are familiar with the contents of these texts and the many atrocities they sanction. I do not deny for a second that religious systems of morality played an important historical role and that many modern institutions were influenced by them directly or indirectly. But this does not mean that we have not outgrown them or that morality has evolved beyond their scope. Moreover, I believe that the stubborn insistence that we cling to such antiquated ethical systems hinders progress in a number of important domains (e.g., human rights, gender equality, reproductive rights, slavery, stem cell research, etc.). Aside from the divisive and frequently dehumanizing effects of religion or problems associated with religious morality, some aspects of religious doctrine are directly harmful. In examining the Christian extremist plague that has been infecting the U.S. for some time now, we find a particularly striking example in the form of "end times" theology. I have previously described how this particular theology endangers us all, it can be effectively reduced to the realization that one will have little motivation to improve one's world if one is convinced that the end is coming during one's lifetime. I describe this as "directly harmful" because the impact of this theology is direct, obvious, and needs no speculation about the pathway through which it might occur. If a politician is convinced that the end of the world is right around the corner, we cannot expect him or her to pursue policies in the long-term interest of our nation and the future generations which will inhabit it. We may even be forced to imagine the same politician attempting to hasten the end through deliberately provoking wars, foreign occupations, and the like. Once again, nobody is claiming that religion is the source of all war. But how many other institutions or belief systems could lead one to bring about mass destruction to hasten an afterlife? How many other institutions or belief systems could so effectively motivate the sort of suicide bombings that have become so common in Iraq? What is so bad about religion is that it divides people and demonizes the out-group to the point where virtually any fate inflicted on them can be justified as divinely sanctioned. What is so bad about religion is that it fosters a primitive form of morality that hinders progress in virtually any domain beneficial to our modern world. What is so bad about religion is that it facilitates the commission of atrocities by good people who are merely pursuing "the divine."